The 1/1-scale, 18-meter-tall statue of the Gundam robot, which was built to mark the 30th anniversary of the Gundam anime franchise, is being relocated to Shizuoka City , central Japan, next July. It is being moved in front of Japan Railway’s Higashishizuoka Station in Shizuoka’s Aoi ward. The city plans to officially announce the relocation with Bandai NAMCO Holdings, the parent company of Gundam’s anime studio Sunrise, at the beginning of the new year. 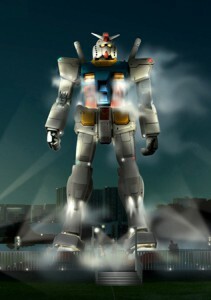 The Bandai Hobby Center, the production factory for Bandai’s Gundam plastic model kits, is located in Shizuoka. The statue will remain on display at Higashishizuoka from July of 2010 to May of 2011, and then be moved to another prefecture. It will eventually be erected near the Bandai Hobby Center.